Wednesday night a spectacular and beautiful total lunar eclipse took place, visible to most of the North American continent. It was, unsurprisingly, a very popular topic on blogs throughout the blogosphere yesterday, with lots of people posting photos of the event. Well, I might as well add my voice to the fray, and my photos, too, even though they’re pretty similar to just about everyone else’s. 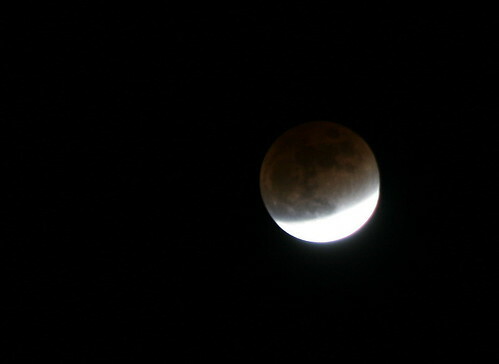 I’m pretty sure this is the first lunar eclipse I can remember watching. I may have seen one or two before, perhaps when growing up, and have simply forgotten. In any case, I’d been thinking I should go out to watch it, but, ironically, it had slipped my mind that it was Wednesday night, caught up in a drawing I was working on. I was only reminded of it when my mom came and told me it was happening. 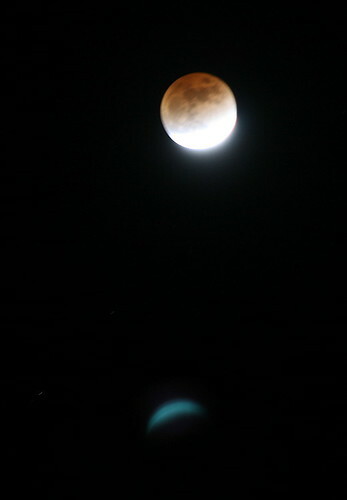 So I missed out on the first part of the eclipse, and caught it midway through. It was a pretty cool show. When I first stepped out it was glowing a reddish orange, with just the bottom “corner” outside the shadow. The last time I looked at it the eclipse was nearly done. It’s a shame it was so cold out, it really discouraged spending a lot of time watching if you didn’t have a good view through a window. 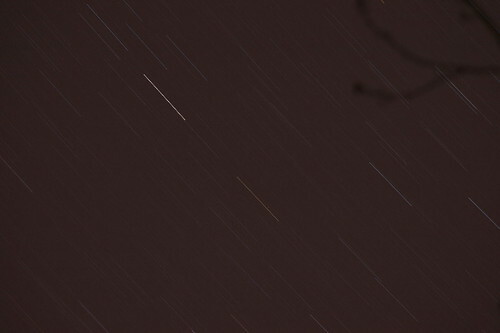 It took me a while to get my camera setup right for long-exposure shots of a bright object. The tricky bit was figuring out how to get the mirror to lock up (the setting was buried in a second tier of the menu). I had the camera mounted on a tripod, and I’d recently bought a remote shutter release (the geek in me was excited about that purchase), but even just the slight shake as the mirror flipped up to take the photo was enough to create a blur in the image. Once I figured that out I was good to go. I saw a lot of photos on the web, but very little explanation of what was going on as this show progressed, so I did a bit of poking around and found this informative site, which I’ll summarize. NASA also has a good page about the recent eclipse. 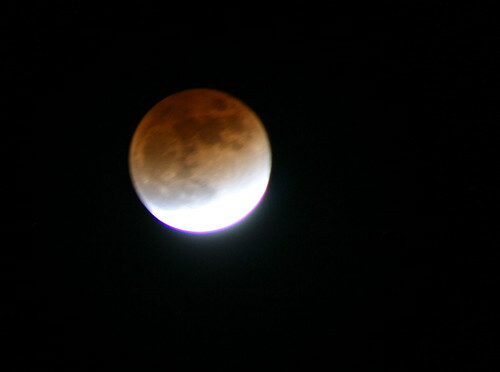 A lunar eclipse is caused by the moon (which has no light of its own, so simply reflects the light of the sun) passing through the earth’s shadow. The earth has two shadows, one from the sun’s direct rays, and then “thinner” shadows where the sun’s rays hit it at an angle (since the sun casts light from all points of its disc in all directions, the “lower” edge of the sun will cast light in the direction of the “upper” edge of the earth). The main shadow, from the direct rays, is called the “umbra”, and the “thinner” halo shadow surrounding it is called the “penumbra”. The penumbral eclipse is very difficult to discern with the naked eye, so all the photos and etc that you see online pretty much deal with the umbral eclipse. 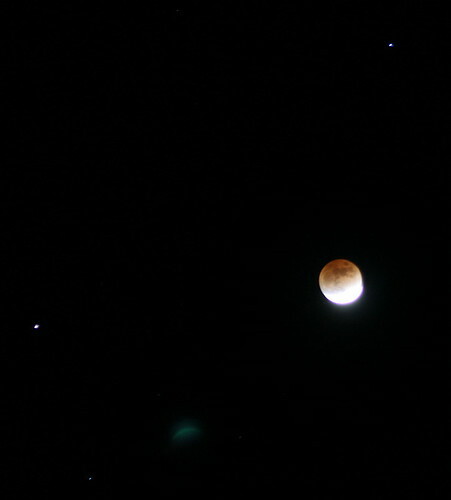 The moon shows up reddish during an eclipse because the small portion of light that gets to it around the sides of the earth is bent and refracted and filtered through earth’s atmosphere, which results in only the red wavelengths hitting the moon. It’s this refraction that allows the moon to be visible during an eclipse; if earth had no atmosphere the moon would be black. An eclipse can only occur during a full moon. It can also only occur when the moon passes directly behind the earth. Because of the way the moon orbits the earth, it’s usually offset enough that it passes above or below the earth’s umbral shadow when its orbit takes it behind the planet. This is why eclipses are so infrequent. Total eclipses, where the whole of the moon passes through the umbral shadow, are very rare, and partial eclipses, where just a portion is in shadow, are only slightly more common. Partial eclipses outnumber total eclipses 7 to 6 (not a big margin, is it?). But infrequent is definitely a relative term. We don’t get a lunar eclipse every full moon, but it’s estimated that between 2000BC and 3000AD (a very long time-span, I’ll admit, at 5000 years and certainly outside of most people’s frame of reference), 7,718 eclipses (both partial and total) will take place. That’s about three every two years (1.5 a year). It’s possible to have up to three take place in a year. The last time that happened was in 1982. The next total eclipse won’t happen until December of 2010. However, there will be a partial eclipse this August. Unfortunately, the Americas won’t be able to see it because it will take place while the moon is below our horizon. The next one the Americas will get to view will in fact be the 2010 total eclipse (western America will get to see a partial one earlier that year, as well). We’ll be treated to two total eclipses in both 2014 and 2015. Other parts of the world will see some that we won’t in the time in between. Visible near the moon during this eclipse were two bright points of light. 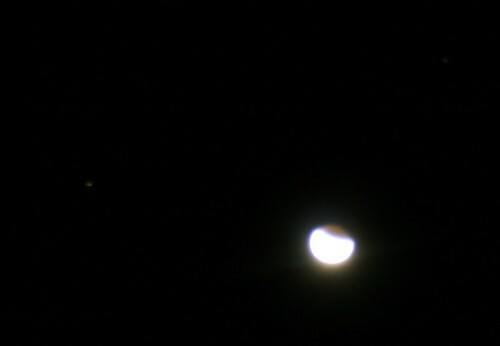 The one on the left, to the east, is Saturn, while the one to the upper right, to the west, is the bright star Regulus. I could see with my eye, but not capture with the camera, that the moon was sitting in the constellation Leo during the eclipse. The little blue crescent in the images I think is some sort of reflection or refraction from the glass of my lens. I kind of liked the effect it created, so left it in. While I was out there messing around with long exposures and night sky shots, I tried playing with a long exposure of the stars. The length of exposure on this shot was 240 seconds, or 4 minutes. It was taken with my long lens on the camera, at about 200mm (I think). The long streaks of the stars were actually created by the earth’s rotation, you can see a bit of a branch that’s stationary. I was surprised that they would be so pronounced with such a (relatively) short exposure! We were lucky here that the moon hangs just outside the window by the stairs, which is also the direction that we have the least light pollution, so we were able to watch it from the warmth of our house. We didn’t watch it a lot, but I looked at it a few times and saw it nearly full. I went to bed before it was completely full, but I got the idea ;) It did make me wish I had a really nice camera to take pictures of it with though. I don’t think my camera could have done much of anything with that. Great pictures and explanation. I was wondering what planet that was by the moon–so it was Saturn. Very well done, thank you. A great job of picture taking and explanation. I also had forgotten about it and the moon reminded me. Yes, it was cold! I wondered if my camera would work ( still use film). I’m putting photos in an album and needed more info. Thanks for a job well done! Thanks, and glad you found it helpful!